This week the Google Docs team released three updates. All three updates have potential to be useful in school settings. 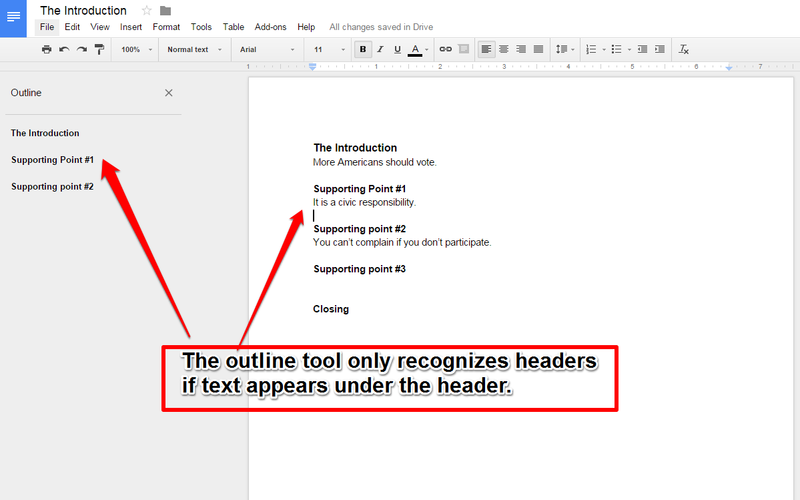 First, Google Docs in your web browser and in the Android app now has a document outlining tool. The outline tool will recognize headers within your documents and create an outline based upon those headers and sub-headers. To access the outline tool select "Document outline" from the "Tools" drop-down menu within your document. It is important to note that in my testing of the new outline tool headings were note recognized by the outlining tool if I didn't write anything under the header. The second Google Docs update of note for teachers is a new option to export your Google Documents to EPUB format. To do this simply select "download as" then choose "EPUB Publication" from the "File" drop-down menu in your Google Document. If you or your students are trying to create ebooks, using the EPUB option in Google Docs could be a good option for you. The problem you will be faced with after saving the EPUB is getting it onto a Kindle, iPad, or other e-reader. You can find directions for putting EPUBs on Kindles here. Directions for putting EPUBs on iPads can be found here. 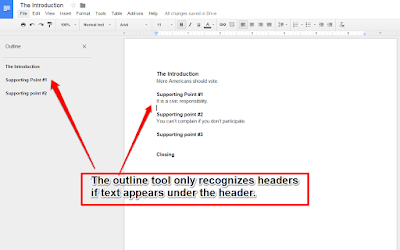 The third Google Docs update that teachers might be interested in is the new option to select, copy, and paste content from the print screen in the Google Docs Android app. Not Google Docs, but Google Slides for Android was also updated this week with support for formatting slides that read right to left instead of left to right.